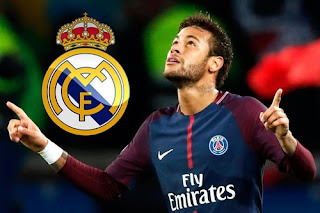 Paris Saint-Germain and Brazilian forward, Neymar, is reportedly negotiating a transfer from the French capital to Real Madrid in Spain. Neymar held secret talks with Real Madrid officials in March as he plots an exit from Paris Saint Germain, according to online reports. The Brazilian star made a world record £200m transfer move to PSG last summer in a bid to leave the shadow of Lionel Messi. But despite PSG’s dominance domestically, Neymar has been a frustrated figure and he has been on the sidelines for the last three months after suffering a serious ankle injury. Neymar was back in Paris, for the final stage of his rehabilitation, and watched on as his team-mates won the French Cup. However stunning reports from Spain suggest Neymar is desperate to leave PSG. According to Spanish outlet AS, Neymar met with Real officials on March 22 when he visited Vinicius Junior, who signed for the Spanish side in 2017. It is claimed that Neymar’s meeting with Vinicius was set up so they could “get to know each other better”. And the report added the official had met Neymar before the publicised March meeting. Real president Florentino Perez has made it his mission to sign Neymar and revitalise his front line. Perez is understood to be ready to spend £227m on Neymar, shattering the previous transfer record. AS say sources close to Neymar are hopeful he has played his last match for PSG. Neymar remains under contract with Ligue 1 champions PSG until 2022.